When you make fried chicken, you're either going to coat the chicken in a flavorful batter, or dredge it in seasoned flour. 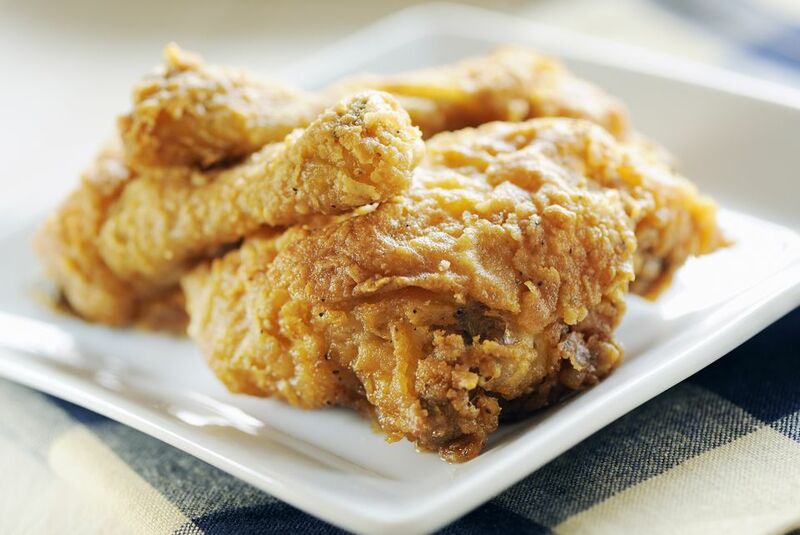 Both methods will make excellent fried chicken, but this recipe uses the seasoned flour approach because it works better with the skillet-frying method (as opposed to deep-frying). Cut the chicken breasts in half crosswise with a sharp knife. The breasts are much larger than the other pieces, so cutting them in half lets all the pieces cook more evenly. Combine the marinade ingredients in a large dish and stir to blend. Add the chicken and coat it with the marinade. Cover with plastic and refrigerate overnight. Remove the chicken from the marinade and let it air dry at room temperature for half an hour on a rack with a sheet pan underneath. Combine the seasoned flour ingredients in a shallow pan and stir to blend. Heat the oil for 5 or 6 minutes, until it's at 350 F. It's best to use a thermometer to measure the temperature and be sure to use one that's accurate. If the oil isn't hot enough, the chicken will be too greasy. Dredge 5 pieces of the chicken in the seasoned flour and carefully add them to the oil. Cook for 10 minutes, then carefully flip them and cook for 10 more minutes or until the juices run clear and the breading is golden brown. Drain on paper, bring the oil back to 350 F and repeat with the remaining chicken pieces.